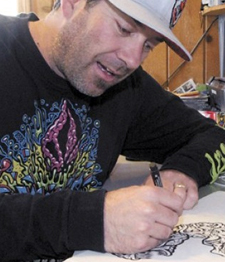 I am Jimbo Phillips, an artist from Santa Cruz, California. Born and raised in the art world. 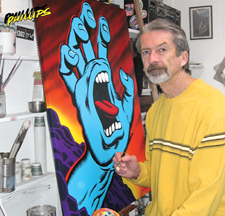 My father, Jim Phillips, designed all the artwork for Santa Cruz Skateboards in the 70’s and 80’s and was the creator of the iconic “Screaming Hand” logo. 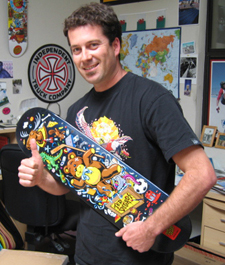 At an early age I began working for my father doing graphics for the skateboard industry, creating eye-popping artwork for t-shirt designs, decals, magazine ads, and skateboards. 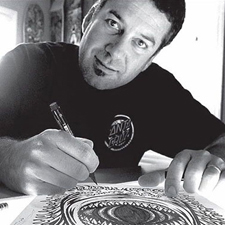 In the early 90s I started my own graphic art business continuing to work for skateboard companies as well as other major brands such as Toyota, Nike, Snickers, Volcom and so many more. Along the way I’ve won some awards for graphics as well as displaying in art shows internationally in Europe, South America and Canada. In 2005 my art was featured on Tony Hawk American Wasteland video game for the Xbox and Playstation2 where the game weaves in and out of my comic book format. I currently have signature artist series collaborations with Bell helmets, Electric visuals, Volcom clothing, Puma shoes etc. 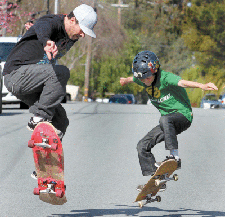 I also have a game app on Itunes called Skatetrash! Art has been good to me so In my spare time I've donated artwork to Second Harvest Food Bank with a skateboard graphic where all the proceeds go to help “Grind out Hunger” feeding families in need. I recently started an online store to offer high quality original art and limited edition clothing and prints directly to fans, collectors and consumers that want to buy products straight from the artist. I try to get all my products from local businesses using only high quality fabrics and materials. People are always asking me where they can find my stuff so I wanted a webshop where I could dream up anything I want without having to answer to a company and the response has been great. The products on my site are not available any where else and I have a lot of new ideas bubbling up that I am excited to show you. A lot of the rock posters and silkscreened prints on there are very limited so when they're gone, they are gone. If you want art that stands out, is highly recognizable, very collectable and is a great conversation piece, then you’ve come to the right place. 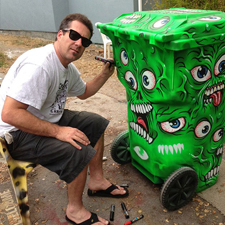 I am an artist who strives to push the envelope of what is possible on a skateboard, t-shirt, poster, sticker or any surface and continue to do so in a fluid yet eye catching style. Keep your eyes peeled for Jimbo’s graphic assault!